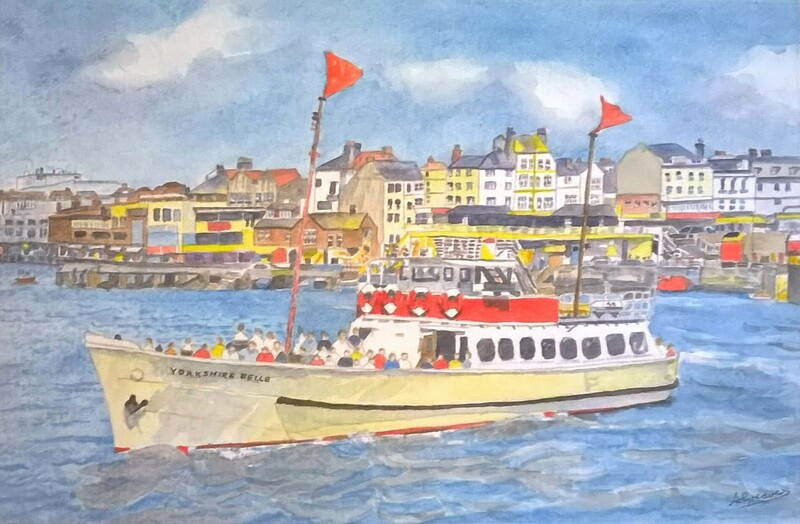 Description: A watercolour painting of Bridlington, Yorkshire, England showing the Yorkshire Bell pleasure boat just leaving the harbour with it's passengers. 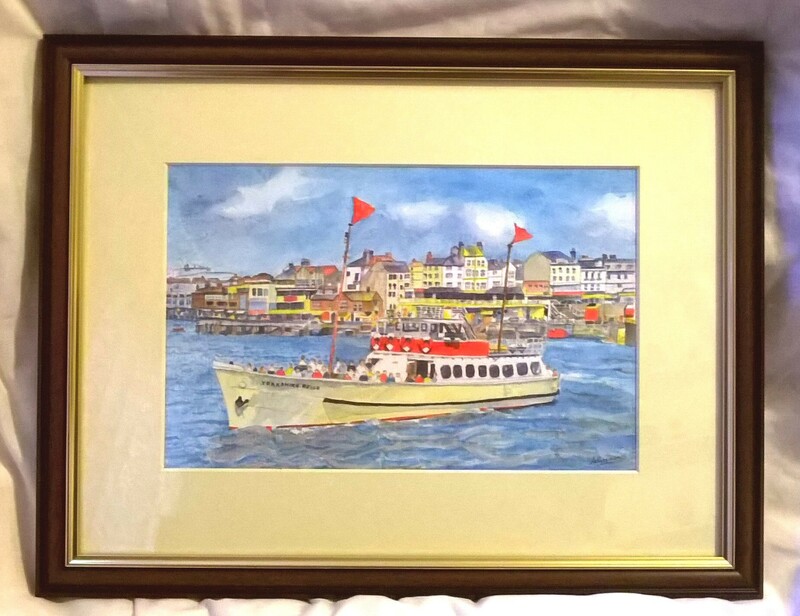 It is available framed in a 16 x 12 inch brown frame with an inner gold line and a cream mount. 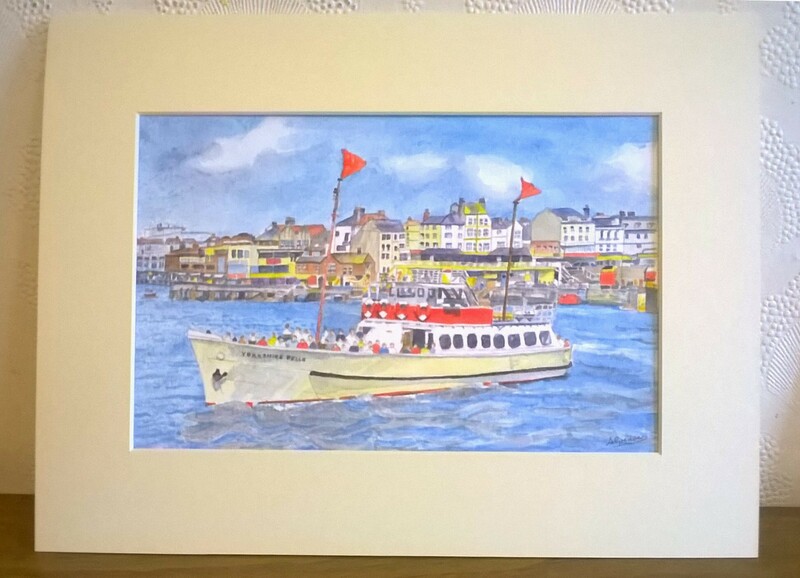 It is also available unframed with or without the mount - just contact me if this is your choice. Delivery Details: Free postage in the UK. For overseas shipping please contact me. Acceptable Payment Methods: Payment through Paypal, cheque or bank transfer. Cheques will have to be cleared before delivery - this usually takes about 5 working days. I HAVE NOW GOT A REDUCTION OF 10% ON SOME OF MY PAINTINGS. I am a self taught artist born and living in Yorkshire, England. I have always had the ability to draw and paint and began painting seriously in 1992. I joined a local art club and began exhibiting with them. Since then I have exhibited around Yorkshire and Lancashire. In 1998 I was elected an Associate of the British Society of Painters at the Ilkley Art Shows. I love painting all subjects in oils, acrylics, water colours and mixed media. I have done several successful commissions and am willing to do more. Please contact me for Gift vouchers for my paintings. You can see more of my art on ebay. Leeds City Art Gallery Open Art Show. Ferens Art Gallery, Hull Open Art Show. Art Shows at the Winter Gardens, Ilkley. West Yorkshire Playhouse Newlyn Gallery. Valley Gardens, Harrogate Art Shows. Meanwood Library, Leeds with the Leeds Painting and Sketching Club.